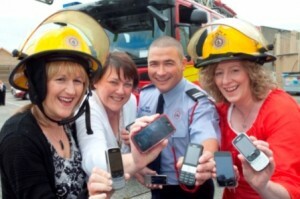 On 20th July 2011 we announced a partnership between Dublin Fire Brigade and the Jack & Jill Foundation. Staff from 13 Dublin Fire Brigade stations have partnered up with Jack & Jill to collect old mobile phones and computer games in a new partnership that came about through Dublin Fire Brigade’s Green Plan which embraces a sustainable approach and strategy to recycling. Mobile phones are a real currency for Jack & Jill, particularly iPhones/Smartphones and for 80 iPhones/Smartphones donated to Jack & Jill, the nationwide nursing team can provide home nursing care and respite for one family for one whole year. The fire crew in Kilbarrack Fire Station, who work closely with the community on environmental impact outreach projects, are taking the lead on this new initiative. All staff members in Dublin Fire Brigade’s 13 stations will collect and donate unwanted mobile phones, including iPhones/Smartphones, as well unwanted computer games including Wii, X box and Playstation games to support the Jack & Jill Children’s Foundation. Every year the Jack & Jill Foundation raises more money through mobile phone recycling then it receives via its €545,000 grant from the State.